Still Lake is the result of not being present as much as I should be during final relaxation in my yoga practice. I am all in during the vigors of a class, during the asanas. But once relaxing at the end, listening to Lakshmi's calming voice leading me through the wind down, my mind conjures up calming environments, often sending me just below the surface of a gentle rolling sea. One visualization I am particularly fond of is her description of a light entering the crown of the head and then filling your body. While the body is melting into this light, my mind's eye turns around to look at it, giddy with trying to memorize this vision. This brings back heavenly images I have seen in the past. Two favorites are the paintings "Spirit of the Night" by John Atkinson Grimshaw as well as the haunting "The Christian Martyr" by Delaroche/Jalabert. They helped fuel the inspiration for glowing light. 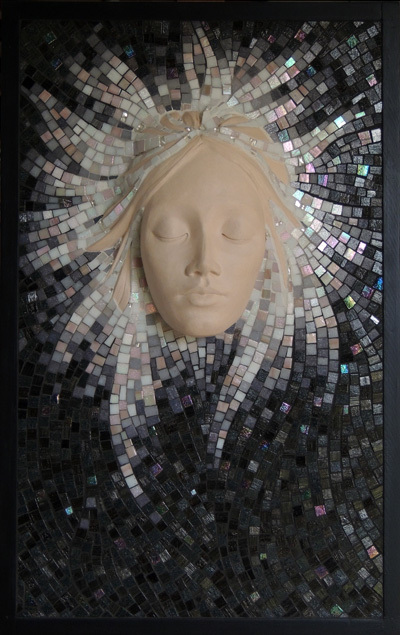 Being recently fascinated with the shape of faces, combining a sculpted surface with mosaic seemed like a nice approach to capturing the image I saw. My model for the serene expression on the face was "La Nature", a beautiful bronze by Alphonse Mucha. Once the face was sculpted, the rest fell into place. The dark vitreous tile supplied the calm void I wanted while still providing room for subtle movement. Nearer to the face, things got more lively with some iridescent tiles picking up the slight pink hues of the face as the values lightened into pure white and silver smalti. Take a look at the close ups to get an idea of what happens as you move aound this piece.